Alzheimer’s disease stole my Grandma Graham’s ability to independently bathe, dress, and go to the bathroom. A woman who used to cook scrumptious meals for holiday gatherings could no longer cook. A woman who used to go door-to-door witnessing to non-Christians could no longer drive. Alzheimer’s robbed Grandma of the independence she so thoroughly enjoyed, and in 2013, she entered a skilled senior care facility in Augusta, Georgia. Her Alzheimer’s gradually worsened. Not knowing any better, Grandma often ventured into other residents’ rooms and crawled into their beds. Several times she hid herself in a crowd of volunteers and slipped out of the facility’s front door without anyone noticing. This formerly sweet woman slapped a CNA in the face when the employee pulled on her arm to steer her back to her room. My grandmother did not have caregivers properly trained and educated in helping people with Alzheimer’s disease. Consequently, her experience inspired me to make a difference in the lives of those with dementia and Alzheimer’s disease and the way they are cared for and treated. Today, I work for Warwick Forest Assisted Living as their Life Enrichment Coordinator, and I am the team captain for the Warwick Forest Walk to End Alzheimer’s team. 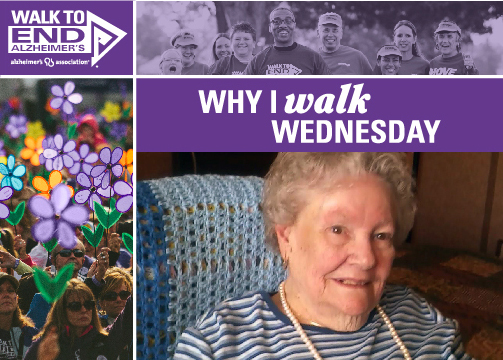 I walk in memory of my Grandma Graham, and in honor of the many residents I work with.